By the Numbers: A Win! 10 = Stops by the Eagles on downs of two yards or fewer. Very unexpected, although if you go through them individually as the above linked article does, you’ll see not a single linebacker’s name among the list of defensive players who came up big in short yardage. 9 = Sacks by the Eagles, including 3 each by Trent Cole and Jason Babin. Note that no one is talking about how bad the wide nine formation is today. 1.4 = LeSean McCoy’s yards per carry. McCoy finally got a ton of carries, but he was largely stuffed. Undoubtedly this will be used as proof that running the ball doesn’t work, and Marty Mornhinweg will call 50 passes next week against the Jets. 12 = Interceptions for Michael Vick in 10 games. 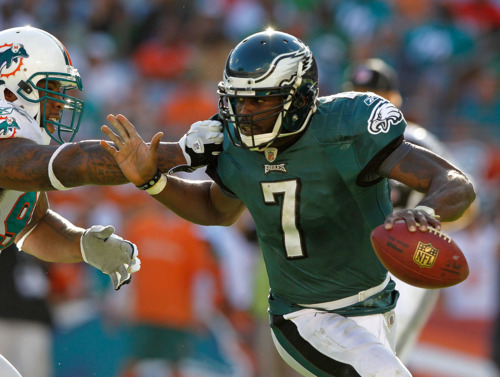 In 2010, Vick had a 1.6 percent interception rate — better than Donovan McNabb’s career rate. This year that’s up to 3.6 percent, which is just barely off the Hall of Fame-type pace set by Mike McMahon in 2005. 57 = Yards from scrimmage by the Eagles in the second half. That’s in 7 possessions, with 6 punts and 1 interception. Good thing they got out to such a big lead in the first half. 1 = Win. If you look at the box score, it’s hard to understand how the Eagles won. Their leading rusher went for 38 yards, their leading receiver for 59, and their quarterback completed only half his passes. Still, getting a victory has been nigh impossible for this team at various points in the season, so it’s hard to be too negative. Plus, playoff possibilities! Tagged with Philadelphia Eagles, NFL, Week Fourteen, Miami Dolphins, Michael Vick, Jason Babin, Defense, Short Yardage, Trent Cole, Sacks, Wide Nine, LeSean McCoy, Marty Mornhinweg, Donovan McNabb, Mike McMahon, Second Half, Playoffs.